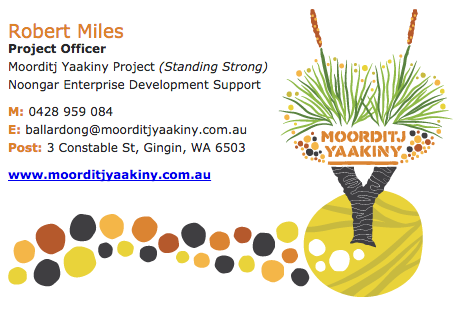 It was heartening to see a large group of people come together on the 6th March at the Northam Bilya Koort Boodja Cultural centre to attend the launch of the Moorditj Yaakiny Project. The enthusiasm was evident as the details of this innovative support project were presented. There are many people to thank as having being involved on the journey to this point and as we continue to gain strength there will be many more involved. From our Ballardong Project Officer, Robert. In the last six months, I have been busy organizing myself to best engage with Aboriginal communities in the region to identify real opportunities to starting and operating a business. My initial engagements have included repeated visits to Kellerberrin, York and Northam as well as making regular visits to Toodyay, Goomalling, Brookton and Pingelly. What I’ve rediscovered so far is that each community is unique in some way and have different set of needs, expectations and priorities to each other. For me, its about recognising and embracing those differences as well as acknowledging individualism within a business context. From here, its about extending the program further to other communities in the region so that the project can be truly measured of its achievements and expected outcomes. I fully intend to bring a range of information, resources and business supports with me as well as run a series of training and coaching sessions for those who are willing to come on this journey with us. Watch this space. The Ngala Wele Karla Launch was held in Moora on the 18th March and it was great to see the enthusiasm this project has generated. The momentum gathering from this project has been profound. We express our sincere thanks to the all those that have helped to develop and support this project and welcome new interest. From our Yued Project Officer, Steph. To see the pride in our people knowing they have the capacity to start their own business, which seemed something only the well-educated or wealthy were able to do, is so exciting. This project has created the pathway to entering and exploring the business realm with the guidance, help and support throughout the journey. It is an exciting venture creating positive lifestyle changes. I have a group of young men, who are now given the opportunity to start up their own business. They were instrumental helping at a centenary event, afforded the opportunity to help with setting up and cleaning up. These men worked tirelessly and helping above and beyond what was required of them. The praises that were given to these young lads has created the platform for the creation of a business. It is with great pride these men now speak of “learning to start up their own business” and this is not an isolated incident. I am honoured to be in this invaluable role and given this unique role paving the way into the business arena and would like to thank the funders, the Dept of Social Services, Juliet Grist who made the DSS application possible, the RDAW Committee and team Mandy Walker, Chris Evans and Pippa Harris and of course my Ballardong counterpart Rob Miles. I see a prosperous future for the Yued and Ballardong peoples venturing on this journey. RDA Wheatbelt is pleased to say that the outcomes already achieved by Robert and Steph have surpassed our expectations. The first six months for our Project Officers has focused on developing their business skills to be able to then support individuals and organisations through the process of setting up their own businesses. Not only have Rob and Steph worked hard with the business mentor and coach, but also well and truly started delivering these projects with many people already engaged in this process and meetings, workshops, engagements with Departments and organisations building strong networks. The aim of the launches were to highlight entering the second phase of the projects where we are officially “Open for Business"
Agristart Connect: Regional Innovation workshop. Gingin Tue 2nd April, 8.30 am to 1.00 pm. M/tea &lunch provided. A free interactive workshop focused on exploring commercialisation opportunities, connecting to the local innovation community and developing your strategic business skills. RSVP by Fri 29 March for catering. Register via this link. The Muresk Institute’s training calendar is a bumper crop in 2019 with more than 40 workshops, professional development opportunities and nationally accredited courses available. Keep up with the latest innovations, skills and practices to stay abreast of the rapidly evolving industry. New Industries WA. Innovation vouchers program. Up to $20,000 for small to medium enterprises to access professional skills, services or knowledge, enabling you to advance your idea or commercial activity in WA. Closing 29 March. Apprentice Plumber Grants. $2,000 to go towards TAFE/RTO fees and text books and a $1,000 tool voucher. Closing 1 April. Regional Athlete Travel Subsidy. Supporting regional athletes who have progressed into the high performance pathway of their sport and are pursuing regional, state and national representation. Funding for out-of-pocket travel and accommodation expenses directly related to competitions and programs. Closing 12 April. Bank Impact. Up to $10,000 for projects tackling climate change, environmental conservation and animal welfare. Closing 12 April. Dreams for a better world. Up to $50,000, three rounds. R 1: Better Living, to improve the lives or living standards of other Australians, closing 5 April. R 2: Brighter Futures, to empower others to learn and earn to have a brighter future, closing 21 June. R 3: Active Community, creating active and healthy communities across Australia closing 13 Sept.
GrainInnovate Fund. New $50 mill pool for startups to help drive the future profitability and sustainability of Australian grain growers. Women's Leadership and Development Program. Submission of proposals for one-off or small-scale projects that contribute towards the Australian Government’s priorities for women on a national scale are invited. Closing 28 June. KidSport enables eligible Western Australian children aged 5 to 18 years to participate in community sport by offering them financial assistance of up to $150 per calendar year towards club fees. Ongoing. The Expo Live Innovation Impact Grant Programme aims to fund novel and innovative solutions that encapsulate the spirit of Expo 2020 Dubai’s overall theme: ‘Connecting Minds, Creating the Future’. Expo’s three subthemes, Opportunity, Mobility and Sustainability, are focus areas for funding. Up to USD 100,000 each to social enterprises, startups and grassroots projects from around the world, based on their potential to impact the environment positively and generate real social value. Entrepreneurs, SMEs, NFPs and gov’t entities are encouraged to submit their solutions for consideration. Opening later in 2019. Entertainment, food, wine and music. BBQ Masters Cooking Competition. Family entertainment, markets, food, rides, local produce and more. Two day motor sport extravaganza, free entry. Cars, stalls, live band and family fun. Family fun day, entertainment, live music, stalls, sheep and wool, fireworks.